Old Tavern Estate - Barrett Adventures the Real Jamaican Adventures. A thrilling day of history tidbits, gorgeous scenery and hiking around the only estate licensed coffee plantation in Jamaica. You will never feel the same way about a cup of coffee again, once you have seen what goes into making your cup of Joe that you drink every morning. This is Miss Pamsy who stands at that tray sorting out every less than perfect bean from the millions of beans that are put in front of her. Not a single bean is roasted unless she has inspected it. Hiking the plantation is magnificent. We are on the way to their private waterfall. 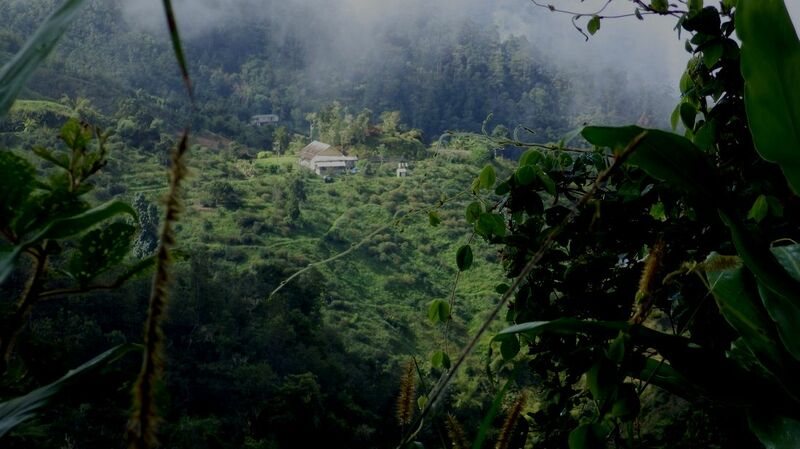 Even if we only take a very short hike, you will get to see coffee growing, up close and personal. Castle Dawson (that big yellow building waaaay down there) is where the coffee beans are separated from the cherries, new plants are carefully fostered and the fermentation is done. If you don't want to hike all that way, we can drive down in our new four wheel drive Fortuner. We are most enthusiastic to return to the house so we can buy some Old Tavern Estate Coffee to take home.